Unlike many of the maple species you will find in your local nursery, the silver maple tree is indigenous to most of Eastern North America. Common in wet areas and along waterways, it produces acceptable sap for tapping in the spring and is an important species in lowland ecosystems. If you would like to maintain a natural feel in your yard or garden while adding a beautiful and unusual species, the silver maple may seem like a good choice. Plant with care, however, as many of the characteristics that allow this species to survive in the wild make it unsuitable for urban settings. Known scientifically as Acer saccharinium, the silver maple is a quick-growing species that may live up to 130 years or more and reach heights exceeding 100 feet. The deeply-lobed leaves are dark green on the surface with a characteristically downy white underside, resulting in a strikingly beautiful presentation when viewed as a whole. The silver maple has the largest seeds, or keys, of any maple species and begins growth earlier in the season than most other species, producing buds in late winter or early spring. These two factors make the silver maple an important food source for squirrels, as the early growth provides a good, natural source of nutrition during a time of year when scarcity can prove fatal to squirrel populations. If you happen to live near a waterway, planting a silver maple will also encourage several species of ducks, most notably wood ducks and goldeneyes, to nest. The silver maple is known for low-growing branches with a wide crotch angle, and makes an ideal nesting site for these species of waterfowl. Additionally, as the Latin species name implies, these trees produce tolerably good sap for maple syrup production in the spring. While not as high in sugar content or as abundant as that of the sugar maple, silver maple sap can provide a fun springtime project of tapping and processing to make your own syrup. 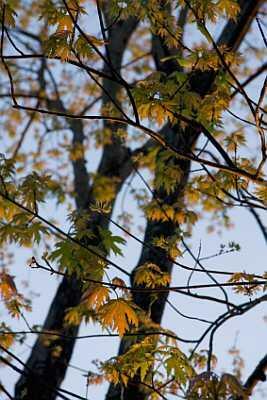 Given a moist, well-drained soil, the silver maple can be expected to do well. Because this species normally grows in floodplains and along waterways, it is well-adapted to swampy, acidic conditions and can tolerate soil pH as low as 4.0. The silver maple grows naturally in regions that attain 32 to 60 inches of annual rainfall, and will grow well with very little intervention as long as these requirements are met. If you are attempting to grow this tree in a drier climate, regular watering may be necessary. To plant this species, choose a location where it will not need to compete for resources. While this is a hardy species, it does not compete well with other trees and will do best if given a lot of space. Dig a hole roughly three times the diameter of the root ball, but no deeper than the natural soil line on the trunk. Fill in the remaining space with garden soil, firm it down, and water well. Prune this tree regularly to avoid the development of multiple trunks or suckers. While this is a beautiful native species with many desirable characteristics, it is not ideal for all situations. The primary drawback of the silver maple is its aggressive, fibrous root system. While the natural root development of the species allows it to thrive in conditions that kill other trees, it can pose a problem in urban lots. Like willow roots, silver maple roots will penetrate septic systems, water lines or other underground utilities. The natural shallow growth of these roots may also interrupt sidewalks and roadways, pushing up the concrete or asphalt and cracking the structure. Additionally, the low, nearly-horizontal branches that make such ideal nesting sites can pose a problem from a cosmetic perspective. Sometimes referred to as a 'soft maple' by foresters, the wood of the silver maple does not have the toughness of other maple species. The low-slung branches and comparatively weak wood leave the tree subject to damage from heavy snow or ice loads. Under the right conditions, the silver maple tree can be an asset to your yard or garden. Just make sure you choose an appropriate site and understand the limitations of the species, and you will never regret planting this lovely maple.